The Economic Survey 2016-17 has been released now. Every year the Economic Survey contains new terms and concepts. UBI is one such concept explained in detailed in this article, quite useful for IAS preparation. Economic Survey 2016-17 has emphasised to embrace the idea of Universal Basic Income (UBI) in place of the subsidy-based schemes. 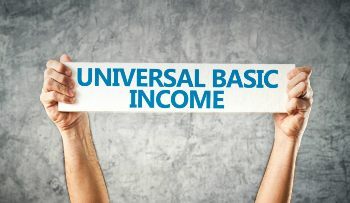 It has proposed UBI as a long-term solution to ease poverty in the country which will guarantee that every citizen has a right to a minimum income to cover their basic needs and necessity. The concept of UBI has now become popular among both types of scholars of the extreme Left and the Right. A web definition suggests that a basic income is also called as unconditional basic income, basic income guarantee, citizen's Income, universal basic income or universal demogrant is a for social security is a form of social security in which all citizens or residents of a country regularly receive an unconditional sum of money, either from a government or some other public institution, in addition to any income received from elsewhere. The concept of UBI should not be confused with the concept of minimum wage or living wage; both are quite different concepts from each other. Universal Basic Income is an essential and compelling paradigm shift in thinking about both social justice and a productive economy as a whole. The idea of UBI postulates that a just society needs to make sure to each individual a minimum income which they can count on, and which provides the necessary material foundation for a life with access to basic goods and a life of dignity. It fosters many of the basic values in the society and also respects each and every individual as a free and equal. The concept of UBI is anti-paternalistic, hence it will promote liberty and it has the greatest possibility of flexibility in labour markets which is quite essential in the countries like India. It promotes equality by reducing poverty. It promotes efficiency by reducing waste in government transfers. It also has potential under some circumstances, even promote greater productivity. Universal Basic Income may simply be the fastest way of reducing poverty in the presence of well-functioning financial system. Paradoxically, UBI is more feasible in a country like India, where it can be pegged at relatively low levels of income but still yield immense welfare gains. In our country poor have been treated as objects of government policies and it is assumed that they cannot take economic decisions relevant to their lives. An unconditional cash transfer, which treats them as an agent will vanish through UBI it will help to establish subjective treatment for poor. Through UBI the state will be in the best position to determine which risks should be mitigated and how priorities are to be set for the poor. UBI is best as an acknowledgement that society’s obligation to ensure a minimum living standard is even more urgent in an era of uncertain employment generation. It has potential to create new possibilities and flexibilities by allowing for individuals to have partial or calibrated engagements with the labour market without fear of losing benefits. UBI allows for more non-exploitative bargaining since individuals will no longer be forced to accept any working conditions, just so that they can subsist. The UBI is the best solution for the existing welfare schemes in India riddle with many flaws like misallocation, leakages and exclusion of the poor. UBI will be best applicable as an efficient administrative delivery tool at the time of the complete adoption of JAM trinity services in India. Poverty and vulnerability reduction Poverty and vulnerability will be reduced in one fell. Households, especially male members, may spend this additional income on wasteful activities. A UBI treats beneficiaries as agents and entrusts citizens with the responsibility of using welfare spending as they see best; this may not be the case with in-kind transfers. A minimum guaranteed income might make people lazy and opt out of the labour market. Gender norms may regulate the sharing of UBI within a household – men are likely to exercise control over the spending of the UBI. This may not always be the case with other in-kind transfers. This income floor will provide a safety net against health, income and other shocks. Given the current status of financial access among the poor, a UBI may put too much stress on the banking system. Payment – transfers will encourage greater usage of bank accounts, leading to higher profits for banking correspondents (BC) and an endogenous improvement in financial inclusion. Once introduced, it may become difficult for the government to wind up a UBI in the case of failure. A guaranteed income will reduce the pressures of finding a basic living on a daily basis. The opposition may arise from the provision of the transfer to rich individuals as it might seem to trump the idea of equity and state welfare for the poor. A UBI in place of a plethora of separate government schemes will reduce the administrative burden on the state. Unlike food subsidies that are not subject to fluctuating market prices, a cash transfer’s purchasing power may severely be curtailed by market fluctuations. For the first time the world in 2008, an official petition for basic income was started in Germany by Susanne Wiest. Her petition was accepted and she was invited to a hearing at the German parliament's Commission of Petitions but unfortunately, after the hearing, the petition was closed as "unrealisable". Another citizen's initiative in Spain received 185,000 signatures in 2015 but it fell short of the required number of signatures for the proposal to be discussed in parliament. The world's first UBI referendum in Switzerland on 5 June 2016 was rejected by a 76.9 percent majority. As it appears to be the case for the country like India, UBI will be a more powerful idea for the implementation of its welfare schemes and it will have juxtaposition for both the thinkers of the Left and the Right. For the adoption of UBI in India, Aaadhar will play a significant role in identifying the citizens, but it is unable to identify the required issues. So, it is very important to recognise that universal basic income will not diminish the need to build state capacity- the state will still have to enhance its capacities to provide a whole range of public goods. UBI is not a substitute for state capacity, but it is a way of ensuring that state welfare transfers are more efficient so that the state can concentrate on other public goods. Another drawback of UBI is that it considers the individual only and not the household as the unit of the beneficiary. This will enhance the case of an agency, especially in the case of women within households. The government should work in this part to avoid agency in the thread.